Trail Blazer is a simple yet horribly frustrating hi lo game. This is all thanks to the laughable bonus feature that was clearly put in place to grind your gears. Basically, in Trail Blazer HiLo you are rewarded for consecutive correct "hi" guesses or "lo" guesses. So if you were to guess "hi" multiple times in a row, you could win an added bonus payout of between 5% and 100%. 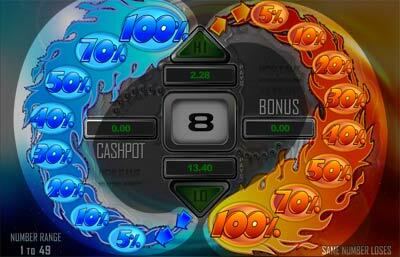 The bonus percentage increases with the number of consecutive correct guesses in the same direction. However, you have to make at least 3 guesses in the same direction before you can even get your hands on a measly 5% bonus. How often does that happen? Answer: Infrequently enough to infuriate you - that’s how often. If you want to play a basic HiLo game that is actually fun, play Crack The Safe. Trail Blazer fun rating - 24%. Just like Paris Hilton, Trail Blazer gets its "edge" from the fact that it’s annoying. That’s its USP (Unique Selling Point). Trail Blazer has very little going for it in the payouts, looks, fun and ingenuity departments. Trail Blazer tries to make up for this by virtually slapping you across the face in each and every game you play. To get a 100% bonus on a correct guess (which is only double what you would have won anyway), you need to make 10 correct guesses in one direction in a row. That’s right, 10. If you guess in the opposite direction just once, the bonus resets itself. Fact: You would have more luck with a raffle ticket in a dodgy pub. An extremely basic hilo game would have been bearable, but throw in a bonus that only exists to annoy you and help you to lose and you’ve created a monster. The boring and annoying type though of course, not the cool kind. Get a miniscule bonus if you get ridiculously lucky. Trail Blazer really is just a simple hilo game with a shoddy bonus feature. Trail Blazer in more detail. The numbers range in Trail Blazer is from 1 to 49. The game of Trail Blazer starts with a random number anywhere between 1 and 49. You cannot shuffle or change this number - you have to stick with it. As usual, you select whether you think the next number will be higher or lower. If you guess correctly, your winnings are rolled over on to the next number and can be wagered again. If you lose, your stake and all of your winnings up to that point will be lost. Fact: If the new number is the same as the last number, you always lose. 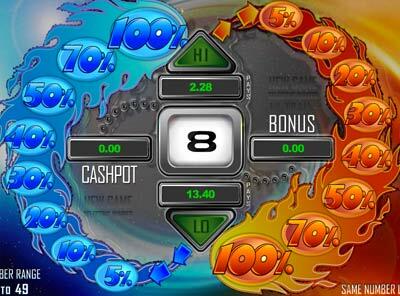 The payouts for choosing higher or lower on a number will vary depending on the likelihood of the outcome. I’ve covered this structure a few times, so if you’re really interested you can read more about it on a review of a good hilo game like HiLo Gambler. 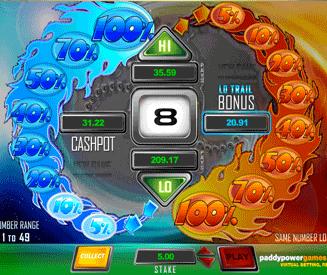 The bonus feature of Trail Blazer rewards you for multiple hi or lo guesses in the same direction. The more correct consecutive guesses you make, the bigger the added percentage bonus will be. If you make a guess in the opposite direction (i.e. choosing "hi" after 4 correct "lo" guesses), the bonus rests itself and you have to start from scratch to work up another added bonus. That’s right, you have to guess lo 10 times in a row or hi 10 times in a row just to get a 100% bonus payout for your current guess. Can you imagine just how incredibly likely that is to happen? Furthermore, to get a tiny 5% bonus you need to make 3 guesses in one direction, which in itself is pretty unlikely. The juice is absolutely not worth the squeeze by any stretch of the imagination. Note: Trail Blazer at Betfred Games is even more hilarious, as the numbers only range from 1 to 20 (instead of 1 to 49), which makes the likelihood of getting 10 correct guesses in the same direction somewhat mythical. Honestly, I don’t believe that you’re going to find a more useless bonus anywhere else in the world of online games for real money. This is a luxury that you don’t get. Trail Blazer doesn’t even have the courtesy of a number shuffle option anywhere in the game. You get what you’re given and you’re forced to like it. Thanks Trail Blazer.